Carroll Out: Who Is Next For USC? Filling the shoes of Pete Carroll will be no easy task. It was clearly just a matter of time after the word leaked Friday, and now it’s official: Pete Carroll will be introduced Tuesday as the head coach of the Seattle Seahawks. The Los Angeles Times noted that USC players learned that this was official via text message on Sunday, at the same time Seattle Seahawks CEO Tod Leiweke was in town to finalize the deal with Carroll. Carroll was not the only coaching loss: Offensive coordinator Jeremy Bates is going to Seattle to have the same job under Carroll. Ken Norton Jr., USC linebackers coach, also will be headed to Seattle, according to reports. The next question is: Who is coming in to USC? Not Mike Riley. He was the hot name but the current Oregon State head coach signed a three-year extension Sunday to remain coach in Corvallis. So now it is on to Plan B for the Trojans. And maybe C.
Other names being thrown into the ring include Tennessee Titans coach Jeff Fisher and Jacksonville Jaguars coach Jack Del Rio, and both have USC ties. Other college coaches including Stanford's Jim Harbaugh and Boise State's Chris Petersen are said to be on the list. 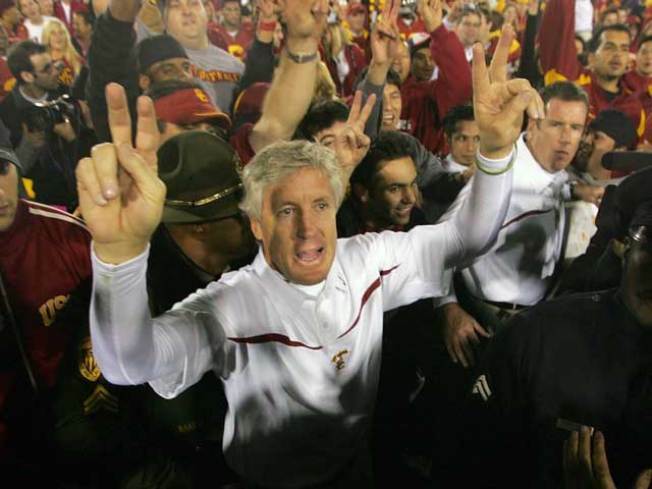 USC fans should not worry too much if they have to go a little ways down that list — remember Pete Carroll was way down the list back in 2000. USC fans were angry he was the choice then, they are angry he's leaving now. The same thing could happen with another quality coach. The question now is: Do any of them want the job? This is one of the glamour jobs of college football, and the new coach will be taking on a storied program that is near its peak. The city loves USC football — win here and you are king. But there also is a lot of pressure and expectations, with some fans bordering on the unrealistic. One 9-4 season this year after seven straight Pac-10 titles had fans frustrated and a lot of empty seats at the Coliseum. Then there is the potential of sanctions coming down on the program from the NCAA, tied to the investigation into any improper benefits Reggie Bush received while playing for the school. If it means a loss of scholarships and no bowl games for a year (or more), recruiting could take a hit. Making it tougher to win. Making the fans more frustrated. Lots of pressure, lots of glory. Carroll thrived in that environment, but now he is off to the land of perpetual rain. Can the next person keep things sunny at USC?